150 years ago, it was the Meiji era in Japan. Meiji was the new era after the Japanese Government abolished “sakoku” the closed-door policy. “Sakoku” era continued over 300 years before the Japanese Government opened the country. Many kinds of foreign cultures were imported to Japan at that time. Since then foreign cultures have been interacting with Japan to create new ideas of beauty. Perhaps it was much more “global” in that something new was kept from being created until then. 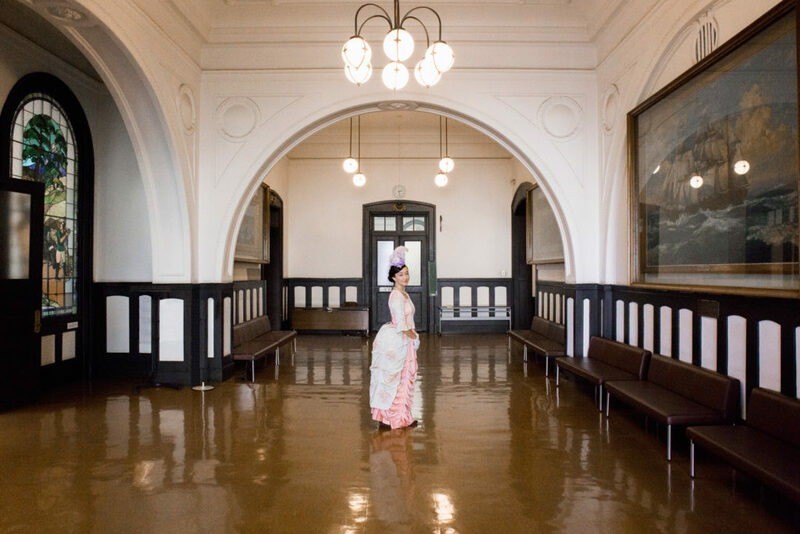 We focus on “bustle dresses” (classical dresses) from the Meiji era. Through reviewing historical literature in Japan and overseas, we accomplished to create original bustle dresses made of antique “kimono” fabrics. We would like to provide opportunities to wear and feel these historical dresses such as international events, parties and so on, beyond countries and nationalities. To create “chemical reactions” by mixing different kinds of culture is the most important mission for us. HISTORY OF "KIMONO BUSTLE DRESS"
The history of Western style dress in Japan started 150 years ago. In 1859, the Japanese Government abolished "sakoku" (national isolation) policy that had continued for over 300 years, it was at this time the Japanese Government opened ports to foreign countries. After that, foreign trades started and many kinds of foreign cultures were imported to Japan. In 1863, Mrs. Pearson opened a dressmaker's shop in Yokohama. It was the beginning of dressmaking culture in Japan. When Western fashion was imported to Japan, the "bustle-style" dresses were prevalent in Western countries. The "crinoline-style" was prior to the bustle style. It had a wide skirt. Compared with crinoline dresses, bustle dresses changed volume allocation to billow on their lower back. With the bustle-style dress, women could feel comfortable while working without the loss of feminine dressing. The bustle-style dress was the first dress that Japanese people saw and wore. As the Japanese Government began to assimilate a western style policy, politicians and diplomats had to adopt western-style clothes. Under such circumstances, Nagako Nabeshima, a wife of a Japanese diplomat wore a bustle dress made of kimono. The silhouette was western, and the used fabric was "kosode"*, a kind of antique kimono. The dress looked gorgeous and graceful. Moreover, even we can find the strong will not only to be involved in Western culture, but also respect the culture and the history of her own country. The new-style dress was born as an outcome of interaction between Western culture and Japanese history. Meanwhile, Japanese culture was exported overseas. It was introduced into many countries through international exhibitions. It was the era of "Japonism". Especially kimonos were of great concern among Western people, and thus bustle dresses made with kimono fabrics were also created in Europe. In this way, these dresses from totally different cultural backgrounds became prevalent in Japan as well overseas. Today, we can see most of them only in portraits. For this reason, we would like to see what will happen if these classical dresses are reborn. This is the the driving force to start our project. We believe that through the fusion of Japanese and foreign culture, and the fusion of new and old, we will be able to get a new idea of beauty in future. *Kosode…A kind of antique kimono. It was mainly worn by women in "samurai "class in Edo era (former era of Meiji). Ayaka was born in Japan. and completed her Master's Program at the Graduate School of Social Sciences, Hitotsubashi University. and participated in city promotion projects. After completing her Master's digree, she worked at Dentsu Inc.
as a copywriter and a creative planner. she was awarded a scholarship from Tempstaff Co., Ltd.
and participated in a internship program in Melbourne, Australia. 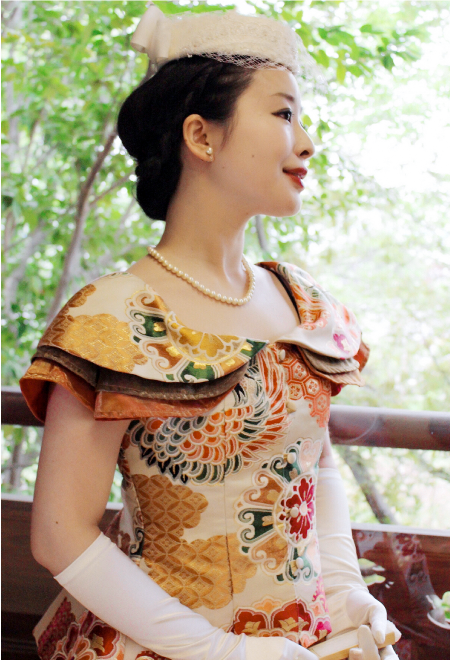 After coming back to Japan, she founded "Classical Princess Japon"
and designs communication plans by using the dresses.